Managing Menopause Naturally: What Every Woman Needs To Know is a video featuring a number of experts in the health and medical field representing herbal, complementary and alternative medicine practitioners – individuals who study the events surrounding perimenopause and menopause in a woman’s life and hHow we view menopause as a society. It’s a fact that there are currently over 70 million American women in the throes of menopause, as evidenced by countless new marketing initiatives on television, online, in grocery stores and everywhere else we look directed directly at that demographic! This documentary film on managing menopause naturally takes a focused look at what menopause is in a physical sense, as well as it’s unique and varying characteristics across cultures via an impressive array of experts in the fields of herbal medicine, women’s health research, OBGYN, and alternative medicine. These individuals offer their knowledge and expertise on what to expect and when, what the natural approaches to symptoms include, and how they integrate with traditional methods of treatment. There are a number of positive elements to this video. The fact that most of the experts interviewed in Managing Menopause Naturally have had first-hand experience with “the change” lends an air of credibility to both content and presentation. The presentations for both traditional and alternative views surrounding the integration of physical, mental, and emotional components that combine to determine who we are as we enter menopause are considered, reviewed, and discussed at length. While the complexity of the physical cycle that represents menopause is recognized, the idea that it is a natural and manageable transition comes through loud and clear, including everything from physical symptoms that include sleeplessness and irritability, to social and emotional considerations such as empty nest. One of the most welcome distinctions of this DVD is the marked absence of strict linear thinking; these women operate in a decidedly holistic but strictly professional environment. The experts who were tapped for this documentary are highly knowledgeable and engaging for the most part. Beginning with an outline of the three basic “blood events” in a women’s life, “menarche, pregnancy and menopause”, they present viewpoints from varying areas of expertise, from herbal medicines to nutrition… to viewpoints on what fifty looks like now from a baby boomer writer and cultural activist. What they provide is the notion that more than ever before we have multiple options for coping with and managing menopause. There is a lot of factual and historic information presented here, along with evidence that menopause is marked not only by physical changes in our bodies and symptoms that include hot flashes, fatigue and menstrual changes, but mental, emotional and spiritual shifts. The fact that the symptoms like hot flashes are unique across cultures never occurred to me – whether it be due to environment, diet or outlook, that alone gives credence to giving a closer look at how we can best moderate our own journey through this time of change. Menopausal changes may be influenced to a great degree in this country by social mores and pressures brought on by a youth-loving culture. Although this work represents the latest in information and viewpoints of contemporary women, the tone and presentation of the content itself may moderate its success. The uninspired interview style, narrative and particularly the background music give a dated feel to this project, more representative of a 1980’s academic documentary than a contemporary work designed to lend depth and interest to this critical topic. Overall, this is a valuable film well worth the retail price tag, with information and viewpoints that all women should have an opportunity to consider and evaluate. The most important “take away” for me was the idea that this is indeed a natural event, not to be feared or dreaded or built up to be something more than a transitional period in a woman’s life, although at the moment I would have to stop just short of “celebrating” this time! 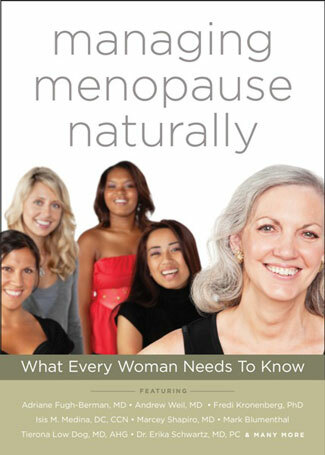 Our bottom-line evaluation of Managing Menopause Naturally: What Every Woman Needs To Know? We say give it a go and then share it with someone.